This five-day in-person training gives participants a thorough understanding of why and when researchers and policymakers might choose to conduct randomised evaluations and how randomised evaluations are designed in real-world settings. The course covers basic concepts related to measuring impact through randomised evaluations and discusses technical design choices as well as pragmatic considerations when conducting a randomised study. It reviews the benefits and methods of randomisation, how to choose an appropriate sample size, and common threats and pitfalls to the validity of an experiment. It also covers the importance of a needs assessment and a theory of change, and how to measure outcomes effectively—tools that are critical for all programme evaluations. Renowned academic researchers from the J-PAL affiliate network and other institutions lead sessions. Course participants will engage in small group discussions with J-PAL SA staff and other participants, providing opportunities to forge connections with your peers. The course is designed for directors, managers, officers, researchers from governments, NGOs/nonprofits, international development organisations, foundations, as well as trained economists looking to retool. Submit the application form by April 30, 2019 to express interest in participating. For further information, see a sample agenda* or view the Evaluating Social Programs course description page. The course fees vary by organisation type and include the five-day training with lunch, tea and coffee as well as all course materials. The fee includes lunch and tea/coffee. It does not include travel or accommodation. The International Initiative for Impact Evaluation (3ie) is offering bursaries for the Evaluating Social Programmes course 2019 to a few selected candidates. The bursary programme is part of 3ie’s effort towards building capacity in conducting and using high-quality impact evaluations and systematic reviews that can generate policy-relevant evidence. Bursaries are awarded to researchers and policymakers from low-or-middle-income countries for training and conferences organised by 3ie or other organisations. For each bursary award, 3ie will cover/reimburse the cost of course fee only. Costs associated with ground transportation such as airport transfer, local on-road transportation, flights, and meals and per diem/daily allowance will not be covered. To be eligible for a 3ie bursary, applicants must be nationals and residents of low- or middle-income countries. Additionally, they should be actively engaged with local agencies, and not multilateral organisations. Additional eligibility criteria, as defined by organisers, may also apply. Additionally, J-PAL/CLEAR SA will be offering scholarship to one (1) student to attend our 2019 Evaluating Social Programmes course. The scholarship is open only for individuals who are currently enrolled in full-time undergraduate or graduate studies. The scholarship will ONLY cover the full course fee for the selected student; travel, lodging and other incidental costs are not included. Kindly note, J-PAL/ CLEAR SA has no further awards beyond the above scholarship. The Abdul Latif Jameel Poverty Action Lab (J-PAL) is a global research centre working to reduce poverty by ensuring that policy is informed by scientific evidence. Anchored by a network of 171 affiliated professors at universities around the world, J-PAL conducts randomised impact evaluations to answer critical questions in the fight against poverty. J-PAL South Asia is based at the Institute for Financial Management and Research (IFMR). The South Asia regional office analyses and disseminates research results and builds partnerships with policymakers to ensure that policy is driven by evidence and that programmes proven effective are scaled up. 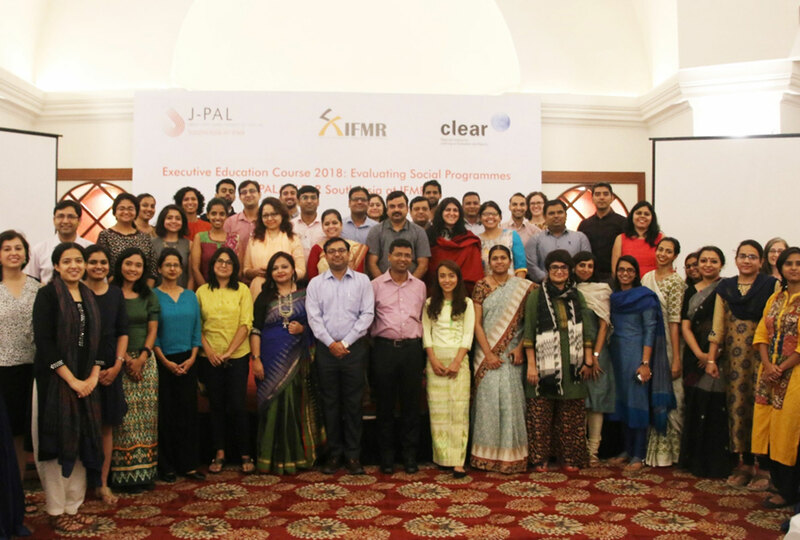 In 2011, J-PAL South Asia at IFMR was selected to host the South Asia Centre for CLEAR (Centers for Learning on Evaluations and Results), a global initiative coordinated by the World Bank’s Independent Evaluation Group. Under this initiative, the Centre seeks to equip practitioners with the expertise to carry out rigorous evaluations through training courses, advisory services, joint research projects, and also host a knowledge sharing roundtable series on fundamental topics in monitoring and evaluation.